In researching the history of the old "Calaboose" or city jail, we began a search for any Sanborn Maps of the city. 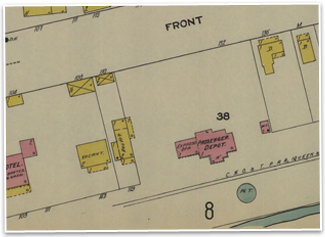 Sanborn Maps are highly detailed surveys of a city and were prepared primarily for the insurance industry. Even back in the 1800's they cost several hundred dollars a set but were well worth it to the insurance industry. We eventually located and obtained copies of the 1893, 1898, 1903, 1908 and 1913 Rockwood maps. There are 33 maps detailing the growth of Rockwood. They are very large maps, 21" x 25" with a scale of one inch = 50 feet. Each map is in full color with the colors denoting various building materials. An extraordinary amount of information is stored on them. They have proved invaluable in substantiating the history of Rockwood. This is just a sample of local treasures that have been lost over the years. It is truly amazing to see the vibrant downtown that is portrayed in the maps. The variety of stores and their evolution provides a better insight into Rockwood at the dawn of the 20th Century. The sheer beauty of these maps led us to want to share them with the city. We had presentation size posters made of two maps which were presented to the City for display in City Hall and the Library. Hopefully these maps may inspire others to investigate the history of Rockwood. We are grateful to the University of Tennessee Libraries' Map Services for their assistance in locating these. Anyone interested in scholarly research using the maps should contact Rockwood 2000.